Not long into his new job at the Post and Courier in Charleston, South Carolina, Jerrel Floyd found himself covering a story that made him laugh, which was not a common occurence in his previous position as a fellow working with ProPublica's Documenting Hate project. The story covered an Olympics-style event held by a few local retirement communities, where the residents engaged in competitions such as a walking race, golf croquet and a spelling bee. It wasn’t a huge, groundbreaking story, but it put a smile on Floyd’s face. “It was just a really fun story that made me laugh, which can be rare sometimes,” he said. It is certainly a change from his reporting fellowship for ProPublica Illinois where he worked after receiving his master's in journalism and public affairs from American University School of Communication (AU SOC) in 2017. At ProPublica, he worked on the Documenting Hate project, which looks to chronicle hate crimes and bias across the U.S. Floyd traveled to abandoned African-American cemeteries to tell the stories behind them. 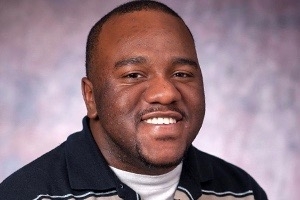 Floyd’s undergraduate college did not have a journalism program, and when he came across SOC’s journalism master’s program in his junior year, he loved what he saw. While at SOC, Floyd was able to hone his journalism skills in the investigative reporting classes, and by working with the Investigative Reporting Workshop (IRW). He says IRW taught him many of the skills he needed while at ProPublica Illinois. Through SOC, he also had the opportunity to work with FRONTLINE and The Washington Post, which he said helped him hone his data skills. “All of the professors [at SOC] came from so many different backgrounds career-wise. That just allowed me to get some exposure to so many methods of telling stories,” Floyd said. Floyd says SOC Journalist in Residence and Managing Editor for IRW Lynne Perri was a tremendous influence during his time at IRW. He also said John Sullivan, SOC journalist in residence and senior editor for the Investigative Reporting Workshop, was a great adviser for him and his classmates.